Your message will stand out on Michigan Radio. Why? Because we have very little clutter. Michigan Radio limits the number of sponsors and the number of messages per program. This means that our listeners are not inundated with spot after spot about our sponsors, giving your message greater impact and a greater chance to influence the buying decisions of our listeners. Traditional advertising is written to cut through the clutter. All the “ACT NOW! !”, “SHOP TODAY!”, “LIMITED TIME OFFER” of commercial radio is designed to grab the attention of the audience because, while they are “dialed in” to the station, they certainly are not dialed in to the ads. As a matter of fact, one-third of commercial radio listeners say that they always or usually change stations during the 16-26 minutes of commercials per hour. Michigan Radio typically airs 1-2 minutes of live-read underwriting credits per hour, surrounded by our high quality programming. Your message, delivered calmly by our respected on-air hosts, is received as unobtrusive and tasteful: well over half of public radio listeners (59%) agree that they pay attention to sponsorship announcements. Have you been considering a Michigan Radio corporate sponsorship? We can answer your questions and get you on the road to sharing your message with our highly desirable audience. Contact us for more info! 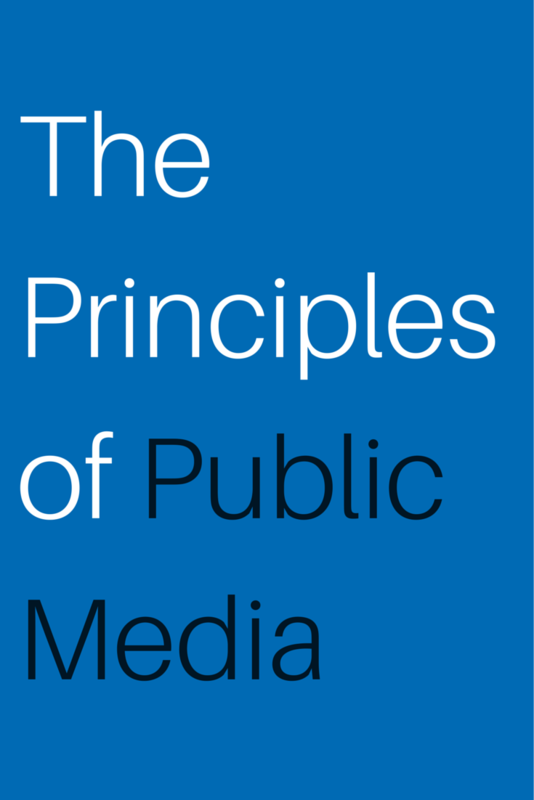 In previous posts on the principles of public media, we talked about what supporting a strong civil society means to us and how we do it with integrity. This time we’re going to talk about how important building relationships are to our mission. We rely on our community to provide us with their perspective, knowledge and experiences and to be a part of the conversations that we are having on a regular basis. In return, we work hard to be respectful, honest and effective in the services that we provide. We also rely on our community to support us financially, both personally and with corporate sponsorship. We understand that businesses need their dollars to work for them, so we make sure that we help you find the best message schedule for your branding or event campaign. Our account executives aren’t just here to sell air time – we are here because we care about the mission of Michigan Radio. More than that, we care about your business – we want to see you thrive and celebrate your success along side of you! *For more information about where NPR and NPR member stations get their funding, click here. In previous posts on the principles of pubic media, we talked about what supporting a strong civil society means to us and how we do it. This time we’re going to talk about how we maintain our integrity while we serve our community. In order to continue to build and maintain our reputation as a trusted, reliable and honest source of information, it is essential for us comply with FCC rules in every facet. This impacts corporate sponsors because the FCC regulates the messages that public media can broadcast about their sponsors, including both the length and content (check out the FCC rules here). The benefit of these rules is that Michigan Radio and all public media escape the high traffic advertising area of commercial media. 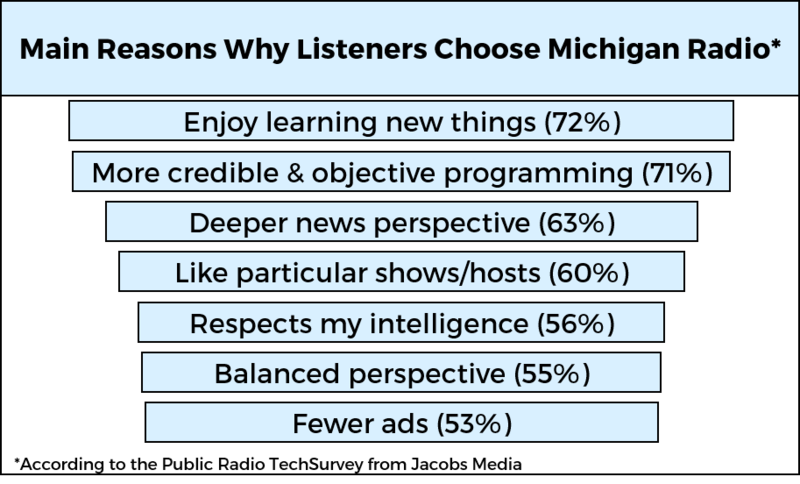 Your message doesn’t have to be bigger, better, louder or faster to reach our audience – as Michigan Radio listener’s, they love the uncluttered, subtle support that your corporate sponsorship dollars provide. In our previous post on the principles of pubic media, we talked about what supporting a strong civil society means to us, as a station. This time we’re going to talk about how we actually go about doing just that. Projects and programs like Stateside, The Next Idea, State of Opportunity and The Environment Report are original to Michigan Radio. That means that we research, interview, write and produce these stories right here at the station. With these programs and projects, we work to engage our listeners in conversation that gets them involved in what is happening in our state, how it impacts each of us and how we can be a part of positive change. As a corporate sponsor, your dollars help to make these vital programs and projects possible. Without you we wouldn’t have Issues & Ale discussions, It’s Just Politics or Michigan Watch! We appreciate your support and will keep putting your dollars to work in important ways!